The Travis County District Court ruled the city violated Texas' open carry law and imposed a fine for each violation which was far below the fine the City of Austin could have faced. In today's ruling the District Court agreed with the attorney general's office and protected the Second Amendment in this case. The City of Austin violated the state's open carry law on six occasions, the court indicated, and ordered the city to pay a fine of $1,500 for each violation. The lawsuit against the city of Austin was filed in July 2016 by Attorney General Ken Paxton after a resident with a concealed gun permit complained he was turned away on several occasions from Austin City Hall. During the trial the attorney general's legal team asked the court to impose a fine of over $750,000 on the city. Under Texas law, the city could have been fined $1,500 a day for the more than 500 days it barred citizens from bringing handguns into City Hall since the lawsuit's filing. "The district court's ruling preserves and protects the Second Amendment rights of Texans and sends a strong message to the city of Austin that they are bound by the same laws as all other Texans," Paxton said in response to today's ruling. "The city of Austin cannot violate the open carry law or any other law the Texas Legislature has enacted simply because they disagree with it," said Paxton. "If the city of Austin appeals the district court's decision, my office will continue to strongly defend the right of law-abiding Texans to keep and bear arms in accordance with our handgun laws." Texas law prohibits people from bringing firearms into courtrooms or court offices, but the exemption does not apply to Austin City Hall. 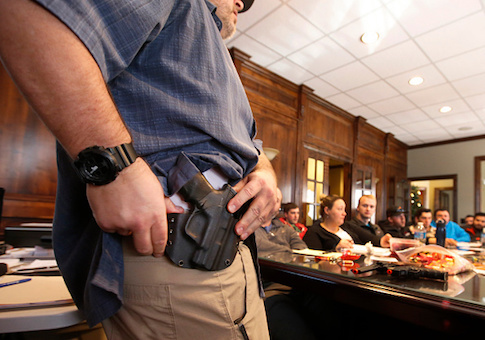 Even if a building has a courtroom, the state's law says that guns must be allowed in parts of the building that aren't exclusive to courthouse functions.